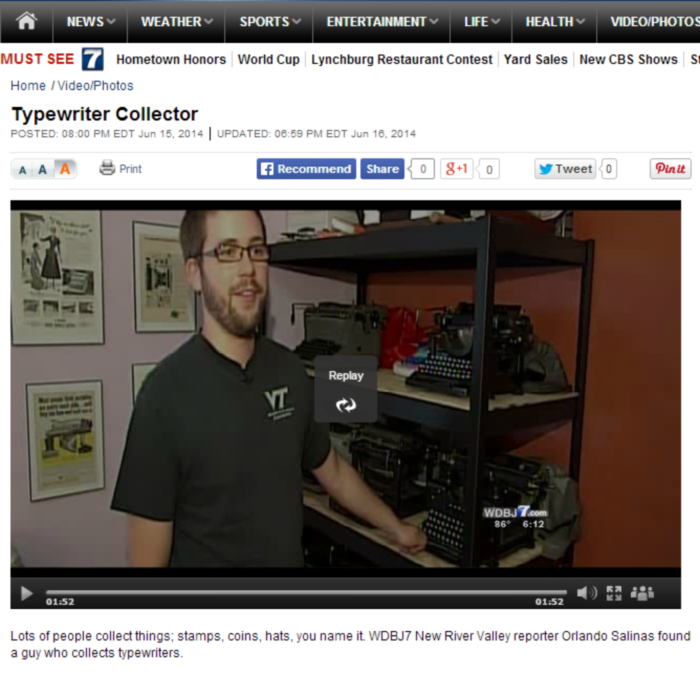 TotallyYourType: Typewriters (and yours truly) on the Local News! Enjoy the short clip and feel free to pass it around, let people know typewriter collecting is indeed a real thing. Congratulations, Mark, I enjoyed the feature! So when are you going to share Tom Hanks' letter in a post? Never really felt sure like I had the permission to. It seems a little strange to me, as it was sent to me and not public. I did add it on facebook though (friends only of course) so I could throw it up here at some point. You had interesting things to say, and great machines to show, but I found the reporter's narrative to be seriously condescending. No, the reporter was fair and wrote an excellent script. Orly is a wonderful guy and would never belittle anyone. Well done! As "Unknown" said, the tone of the story was kind of condescending ... as if typewriters weren't chick magnets! As if you had to be nuts to like them! But that's just part of the "man bites dog" tone that journalists think they need to use. FYI, there's no relationship between Hammond organs and the Hammond typewriters. I had no idea they were not associated, just kind of assumed they were. I still want a Hammond though. Good one, good sir! And we even get to know you just a little bit more. And a voice to attach to the face! Great feature and let's face it people, it is a curious obsession which many people just wouldn't get. I'd wondered about the Hammond connection too but Richard sheds light, as ever. Well done!!! The reporter was obviously grasping for material asking something as stupid as "are they chick magnets?" -- but you did very well and your collection is awesome. It was a throwaway line, as you'll find in most features. Orlando Salinas is one of the best in the business, and beloved by those who know him. He was a very friendly guy and I liked him enough to invite him over. You lose things when you edit an hour of filming down to less than two minutes. I think it came out pretty good.